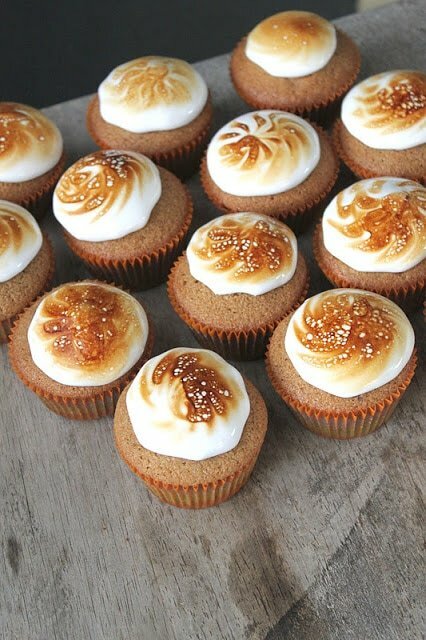 These s’more cupcakes transform your favorite summer childhood treats into a portable little cakes! I wish time machines existed and time travel was a reality. I’d love to go back to the Age of Reason, the Industrial Revolution, and my favorites– the Renaissance and Baroque period. For now, I’ll just have to settle for food to take me back in time. Food is a vehicle for keeping memories alive, passing down tradition, and reminiscing about the past. Whether it be your grandmother’s apple pie or your dad’s barbecue, food evokes memories and experiences. No other dessert reminds me more of my childhood than s’mores. S’mores made by my mother at home over the stove, s’mores over a grill during summer parties, and s’more made during high school bonfires at the beach. What was once reserved for children and the outdoors, s’mores have gained much popularity and can be seen everywhere. 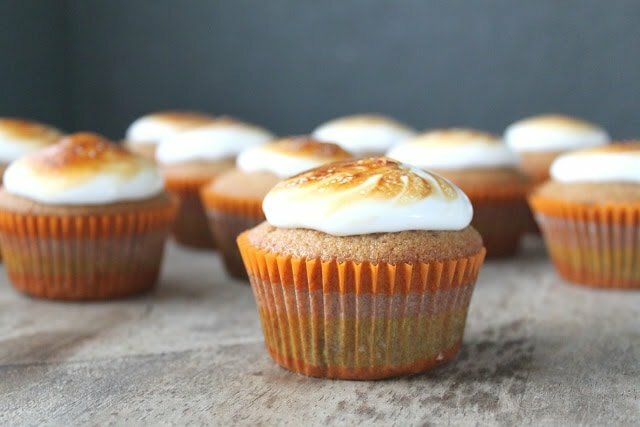 S’more have been made into cakes, hot chocolate drinks, French macarons, brownies– you name it and the graham cracker/chocolate/toasted marshmallow combination has been experimented and done. Every so often, I get the urge to make some s’mores. They remind me of the days when I thought Hershey’s chocolate bar was the best chocolate ever–before I was introduced to Valhrona, Scharfeenberger, single origin cocoa beans, and the like. This is a great recipe from the Los Angeles Times Test Kitchen. 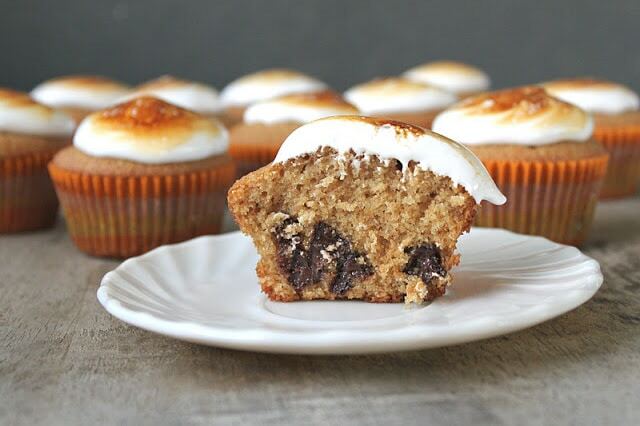 The s’more cake tastes just like graham crackers. I love how the chocolate chips melt inside the cake giving you a nice surprise with each bite. Not only is the marshmallow frosting easy to make, its so tasty and not too sweet. Its a simple cupcake to whip up while you remember the good old days. Preheat the oven to 350 degrees F. Line muffin tray with liners. Sift together graham flour, all purpose flour, baking powder, salt, cinnamon and allspice together. Set aside. In the the bowl of a stand mixer fitted with a paddle attachment, cream butter, sugar, and honey on high speed until light and creamy. Turn the speed down and add the vanilla and eggs, one at a time, occasionally scraping down the sides of the bowl. Slowly add the sifted dry ingredients to the butter mixture on low speed. Mix until just combined. Add the chocolate chips and mix until combined. Divide the batter into the lined muffin pan, about 1/3 cup in each. Bake until tops are golden brown and a toothpick comes out clean, about 20-25 minutes. Cool the cupcakes on a rack while you prepare the frosting. In the bowl of stand mixer fitted with a whisk attachment, pour 3/4 cup water and sprinkle gelatin over the top to soften while you make the syrup. In a small saucepan, bring the remaining 1/4 cup plus 2 Tbsp water, corn syrup, and sugar to a boil. Boil until solution registers 235 degrees F on candy thermometer. Remove from heat. With the mixer on low speed, whisk the gelatin and water. Pour the hot syrup slowly into the side of the mixing bowl. Once all the syrup has been added, whisk as low speed until the mixture is frothy, then gradually increase the speed. As marshmallow mixture gains volume, it will thicken and you'll be able to increase to high speed. Continue to mix at high speed until marshmallow topping is very fluffy and has increase in volume by 2/3. It should take about 10 minutes. Prepare a piping bag with a large decorator's tip. Spoon frosting into the piping bag. Pipe it out onto the cooled cupcakes. These cupcakes are so beautiful! 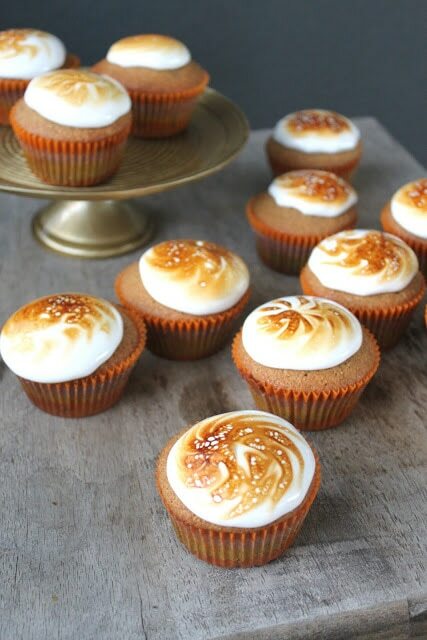 Love the browned marshmallow on top. These look delicious! 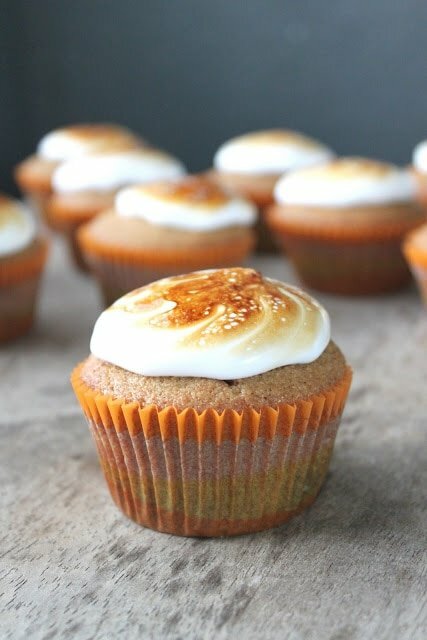 I like the fact that these are more graham than most smore cupcakes. They really do look delicious-thanks for sharing these-yum! @Tina-Thanks, Tina. It was my first time using graham flour. I think I’ll be using it more often now! Yum! I love all the ingredients in this. The recipe sounds scrumptious.